Dimensions London in Partnership with Awesome CIC new classes for kids, teens and adults. Our Street dance classes offer an introduction to street dance. Street dance is a powerful and graceful dance that challenges your body. It is a freestyle dance and explores many genres of dance, with also improving stamina, flexibility and confidence. General street dancing classes cover everything from traditional hip-hop, to popping and locking; so be prepared to change styles at any time. There are also opportunities to perform at shows and also be a part of our projects and carnival season at Nottinghill and Hackney carnival to name a few. To join this class please complete the Registration form at the bottom of this page. Carnival Dance is an energetic and enjoyable way to keep fit. Dimensions has structured a dance programme for 30 people (15 children and 15 Adults) to participate in a carnival project for the year. The project will train participants through the year, improving stamina, confidence and fitness, introducing all to this new style mixed with traditional dances giving you the foundation to caribbean dance. This is a year long project which events planned for the team to perform at throughout the year at such event as Big Dance Bus, Nottinghill and Hackney Carnival to name a few, which means this project takes commitment by dancers and must adhere to set rules. This project are subject to class fees, but all expenses are paid for uniform, costumes and travel to events plus more. This is not a project for beginners, all applicants must have some basics in dance no matter the style. Our classes are designed to develop co-ordination, transitioning, introducing technique and building confidence in a friendly and supportive environment. 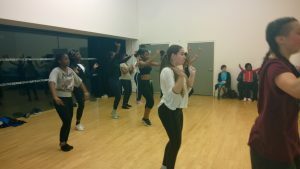 Students learn caribbean dance styles, including Island Hop, Carnival dance, Soca dance, Dancehall and Afrobeats; to the latest tunes and all classes are taught by DBS checked, experienced teachers. This project is geared to building a team that will promote Caribbean dance art giving to a taste of the caribbean carnival scene to new audiences, performing in costume at various events and carnival throughout the year. Dimensions are looking to develop in various aspects of the dance and carnival industry as well as our community. If you are invested in any other dance styles or course please add your other interests onto your Registration form below, we will be the able to monitor interest and provide future classes/ workshops. Health * Is there any health conditions that may limit your activity? Learning * Do you have any special learning needs? Communication * How did you find out about Dimensions ? Ethnicity * What is your ethnicity. Please type below.